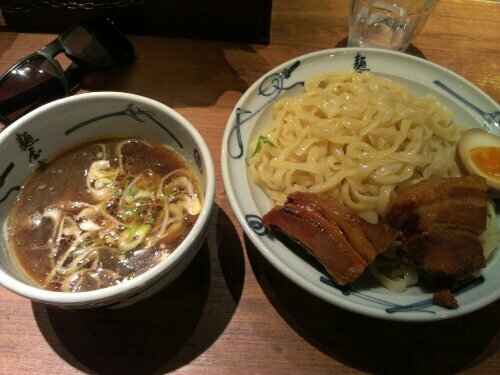 @Shinjuku | Get Your Grub On! Second Rounds at Menya Musashi! I just had to come back here before leaving Japan and even that I originally intended to have this fantastic ‘Tsukemen‘ again, standing in front of the vending machine I reconsidered and changed for the “upper left” signature bowl. Since I started this blog I find myself more often trying new dishes rather than just going with the usuals which I find a pretty positive development as I’m normally a creature of habit and rather go with what I know i like. I went for the thicker broth, fat noodles and medium size and didn’t have to wait very long for it to arrive. Compared to the ‘Tsukemen‘ from last Sunday this broth was slightly lighter but still on the salty side which worked great together with the fat springy noodles. I seldom had these wider noodles before but I think I do prefer them over the usual thinner ramen noodles as they seem to transport the broth much better and are not getting soft as easily. All ingredients here tasted fresh and delicious even that the egg again and unfortunately wasn’t that special at all. The pork belly though had the same tenderness and delicious texture I had missed all week. I savored each bite knowing well I won’t have the opportunity to taste this for probably a long while. After i had slurped my bowl dry I wondered if I could have managed to finish a large portion and if one of the buttons on the vending machine would actually have given me some extra of that fantastic pork belly. This place is well on my radar now and even that I heard the branches in Singapore are completely different I might give them a shot to see the difference between them and the mothership. After over three years I finally made it back to Tokyo and upon arrival at Narita I realized how much I actually had missed this place. This time around though I came much better prepared in regards to what food I had lined up for my two week stay here. The list was much longer than the days I had available but you always have to keep something for next time. 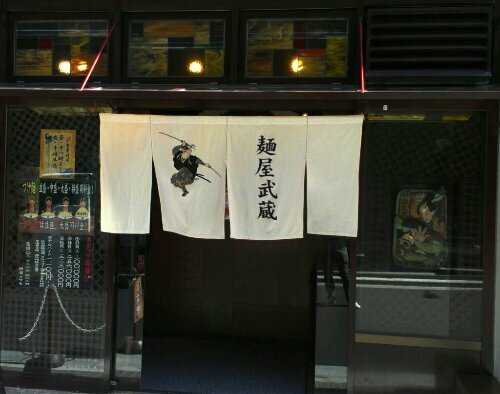 After I had checked into my hotel and freshened up I headed straight for Shinjuku to have my first ramen of the trip at ‘Menya Musashi’s’. As geographically challenged I intuitively head into the completely wrong direction but since there was no ‘Mos Burger’ anywhere to be seen as indicated on my map I turned on the spot and eventually reached my desired destination. Tip for all if you can’t find the west exit of Shinjuku Station, just walk around the building until you do and you’ll be right on track. 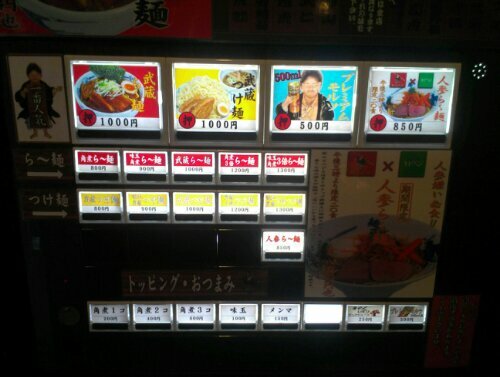 At the shop there were only three color coded pictures on the vending machine – a red one for their signature ‘Shoyu Ramen‘, a yellow one for ‘Tsukemen‘ and a white one for what I guess was ‘Beef Ramen‘. Each color gives you a choice of four buttons with no further picture explanations for the non-Japanese amongst us. I knew that I definitely wanted to try their ‘Tsukemen‘ and so I tried the only of the yellow buttons that had red Japanese signs on it (1,000 JPY) thinking it might be a sign for a spicy version; it wasn’t. After I had passed my order to one of the guys he asked me for my choice of size and broth and I went with medium and “kotteri” (thick and stronger broth). I was a bit concerned if I would get the delicious looking pork belly and eggs that all other guests seem to have ordered but when my bowl arrived it thankfully came with full specs. The looks and taste were beautiful. 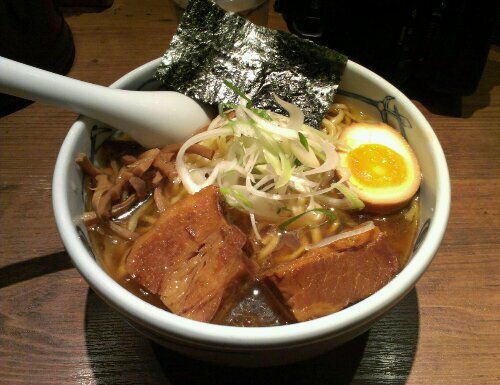 The broth was dark and rich and pretty salty – oh so very very salty – which was perfect for soaking the “futo-men” (fat noodles) in it before starting the big slurps and yet made me gulp down several glasses of the free ice water to prevent my tongue from drying out. The noodles were nice and chewy and I appreciated very much that they make them a bit broader here. There were two big chunks of pork belly in my bowl that they cooked in Japanese wine and soya sauce for hours so the fatty parts melted away and the meaty bits fell apart. I tell you this could be a dish by itself and I felt like gobbling it down at once but paced myself to have little pieces of porky goodness all the way through my seating. The one thing I expected a similar level of perfection was the egg which unfortunately was not so super special, nice and waxy sure but I had better. This one surely made it on my list of places well worth remembering and I’m sure I’ll return here when I’m back in Tokyo or maybe even during this stay. Ramen shop atmosphere in Japan just is a little different than in Singapore and even that I hardly spend more than 20 minutes in here I really liked it; interior, shouting chefs and all. So if you take the wrong turn as I did don’t give up yet, it might just be worth the search. Look out for the noren with the swordsman.